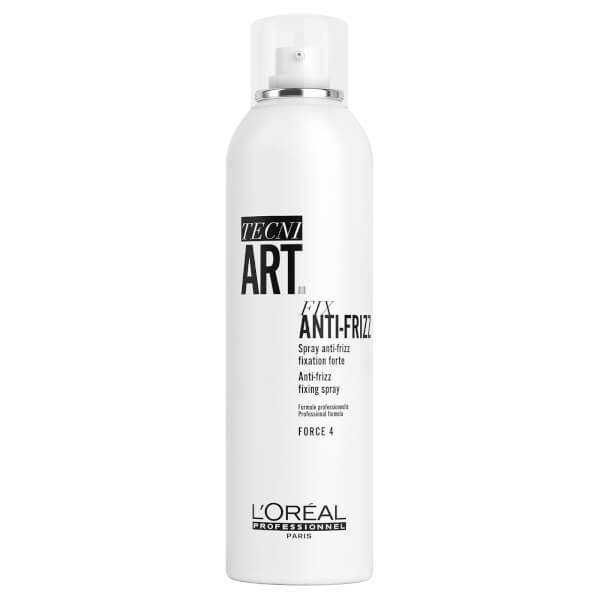 Achieve a salon-worthy finish with the L'Oréal Professionnel Tecni.ART Fix Anti-Frizz; an innovative hair spray that delivers 24-hour protection against frizz and humidity. The weightless formula can be applied to damp hair to tame and control, or dry hair for long-lasting hold without residue or crunchiness. Expect smooth, manageable tresses with enhanced shine and minimised flyaways. Can be applied to damp hair to tame frizz, or dry hair for long-lasting hold. Alcohol Denat., Dimethyl Ether, Acrylates/T-Butylacrylamide Copolymer, Aminomethyl Propanol, Ppg-3 Methyl Ether, Ethylhexyl Methoxycinnamate, Peg/Ppg-17/18 Dimethicone, Linalool, Limonene, Butylphenyl Methylpropional, Hexyl Cinnamal, Hydroxycitronellal, Benzyl Salicylate, Citral, Parfum / Fragrance. C22169/1.